Sonos Controller is an iPhone app to use as a remote control for your Sonos music system manufactured and sold by Sonos Inc. This review was done using 2 Sonos S5 speakers and 1 Sonos ZoneBridge 100, in conjuction with the Sonos Controller iPhone app. Another review to follow will focus on the Sonos Controller for iPad. 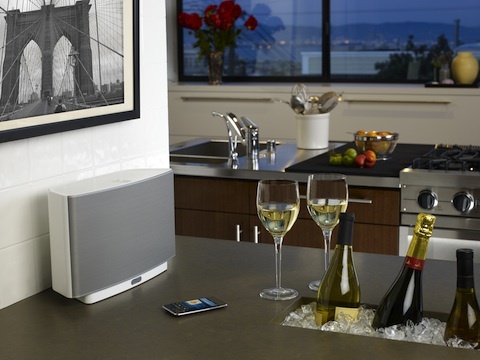 First things first, buy and configure your Sonos music system. The Sonos folks have made setup pretty simple and straightforward. You need to have a dedicated computer in your home that will serve as the main server for your music files. You are recommended to configure that computer not to go into sleep mode so that your playback doesn’t get interrupted. Connect the speakers and ZoneBridge to a power supply. Install the provided Sonos Desktop Controller software on your Mac or PC. Connect your ZoneBridge via Ethernet to the host computer and your home router, the follow the setup steps in the software to sync them with to your Desktop controller. You give a name to each speaker (zone) in the house for your own reference. SonosNet, the Sonos wireless mesh network, has the ability to play different (or the same) tracks on more than one speaker in different rooms simultaneously, all without any wires. 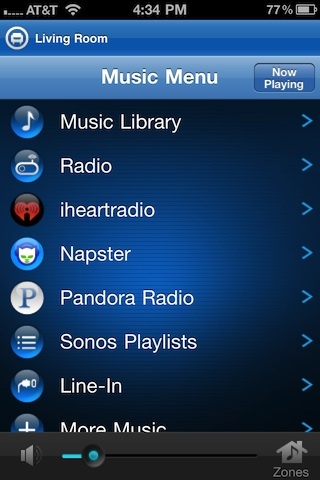 Once you have your speakers and the bridge hooked up, you’re ready to start using the Sonos iPhone app. When you first launch the Sonos iPhone app you’ll connect it your Sonos network. The process is a matter of pushing a couple of buttons (mute and volume up) and you’ll have all your Sonos zones accessible from iPhone app. 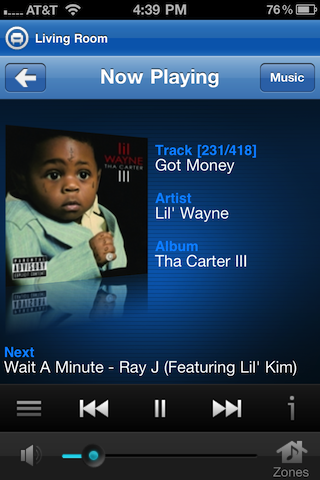 You can do pretty much everything you can do from the Sonos software in the iPhone app. Sonos iPhone app lets you play your iTunes music library, after its synced with the files on your host computer. The sync process is not real-time. This means if you add music to your say iTunes library, Sonos doesn’t automatically pick it up instantly. You have to do a manual process for “updating your index” in the Desktop Controller to get the updates. For convenience, the software has an option to schedule an update to happen every day at a specific time of your choice, or you can start an update from the Settings menu in the Sonos iPhone app. In addition to your music library, you can play streaming music from radio stations in your local area, or around the world, and hook into your web based, and subscription based music services like Napster, Pandora, Rhapsody, iheartradio, SIRIUS, and Sonos’ own built in digital radio offering. Sonos gives you an automatic list of Local Radio stations based on your location, which is extremely useful. Sonos’ radio station list we pulled up contained pretty much every single local station, both AM and FM, and even included HD channels. This is a powerful feature of the Sonos system for when you want to listen to party mixes or just listen to your local news or sports broadcasts in the house, and gives you the ability to further leverage your active subscription services. The Music Library section of the app is broken down into Search, Artists, Albums, Composers, Genres, Tracks, Imported Playlists, and Folders. To get access to your music files Sonos uses the file sharing feature of your host computer’s operating system, which you have to enable. You can search for tracks by artist, album, and name. The Imported Playlists section pulls in lists you’ve created in your iTunes for playing them in Sonos each time you update the index. When you find a song, you can choose when you want to play it. The options are: Play Now, Play Next, Replace Queue, Add to Queue. Your queue can be edited by dragging or deleting songs in the list. You can also view the song info like All Tracks on Album and Artist info. The player has a volume control and zone switcher for switching between your speakers. Another neat feature in the Sonos iPhone app is the alarm. You can set sleep timers or wake up alarms to wake up to any of your music files, radio stations, song streams or just the Sonos Chime. One of the things that I wish the Sonos player did was show the star rating information of your music library, maybe the top rated songs, although you can always create a smart playlist in iTunes and see it under Imported Playlists. Another missing feature in Sonos for iPhone as of now is the ability to use the built in iPod control menu by double clicking the home button. This would be really helpful, especially for being able to quickly pause or fast forward songs. One final improvement that would be nice to have is a more attractive looking icon for the app itself that better shows off its amazing underlying technology. Overall, Sonos app for iPhone gives you full control over your Sonos entire home entertainment sound system, is easy to use and is packed with a ton of external music service plugins for added flexibility and options. As a free add-on to your in Wireless Multi-Room music system, its a no brainer and a must have. AppSafari review of Sonos Controller was written by Joe Seifi on November 21st, 2010 and categorized under Accessories, App Store, Free, Music, Remote. Page viewed 5757 times, 1 so far today. Need help on using these apps? Please read the Help Page.